Daeyoung somberly informs her that Moyeon’s been kidnapped and Shijin’s gone off on an unauthorized solo mission to rescue her. She guesses that he’s going after them. He reminds her that she once said his present (aka her) was on the way and asks if he can ‘open it’ now. He swoops in to kiss her forehead. Good grief the way he looks at her is just adsjf;sdafk. 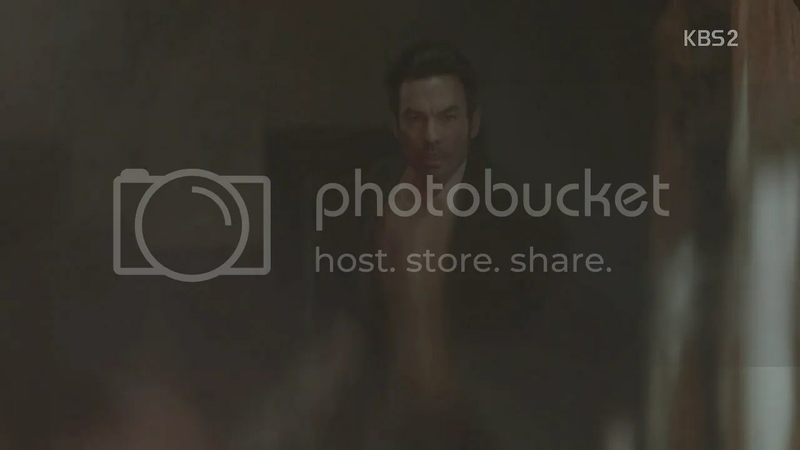 I’ll let the screencaps talk instead. His gaze doesn’t let up on its intensity as he reaches inside his shirt, breaks off his dogtags and hands them to her. He even makes a light joke of it, asking her to keep them safe or he’ll have to pay for new ones. She’s worried as hell but puts up a brave front. Meanwhile it’s pandemonium at the Blue House. General Yoon sits stone-faced among the chaos, the only person there who knows what Shijin’s up to. Back in Urk, Shijin vaults over the wall into Argus’s compound, taking out the guard stationed there (really though? Argus only had one guard at the gates to his lair?). 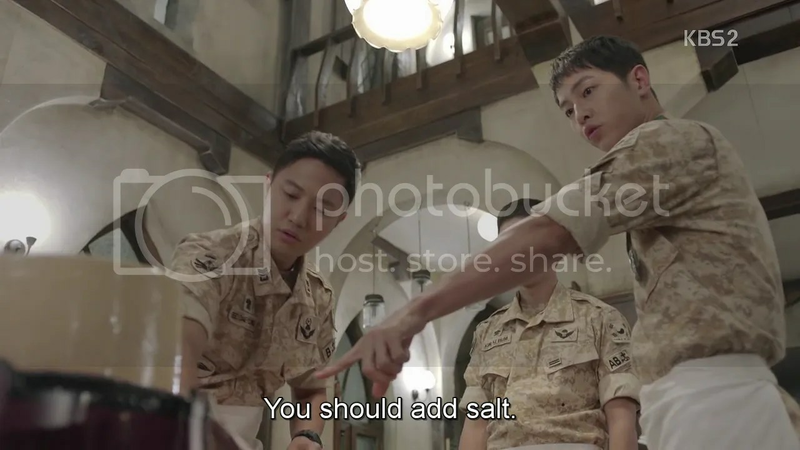 The fellow manning the cameras within the compound notices Shijin’s arrival and prepares to welcome him with a bullet but Shijin manages to toss him over a balcony. He races into the room where he believes Moyeon is, only to find a group of children, no doubt being kept for selling by Argus. 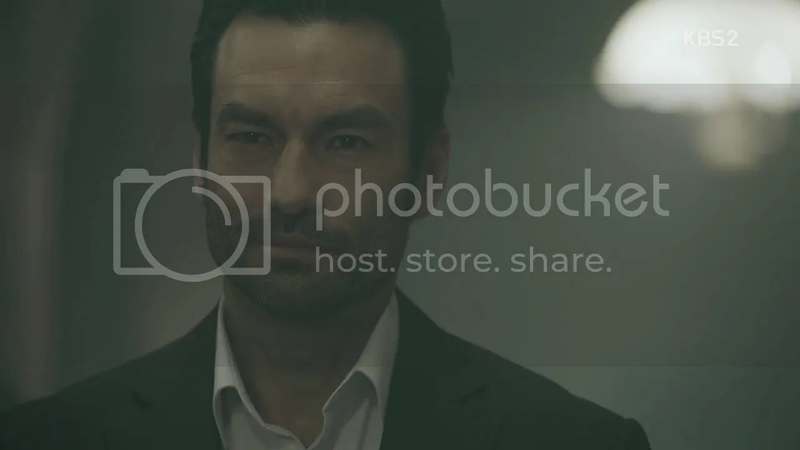 He puts a finger to his lips,a sking them not to give away his presence, and quickly shoots out the camera watching the room. Meanwhile, Argus and Moyeon are in a separate, far more spacious room. Fake UN informs Argus that the weapons deal with North Urk is done, with the money transferred. Argus gleefully dumps all evidence (aka throws the laptop in the fish tank) and packs his money in a briefcase. He’s quite chipper, even singing. 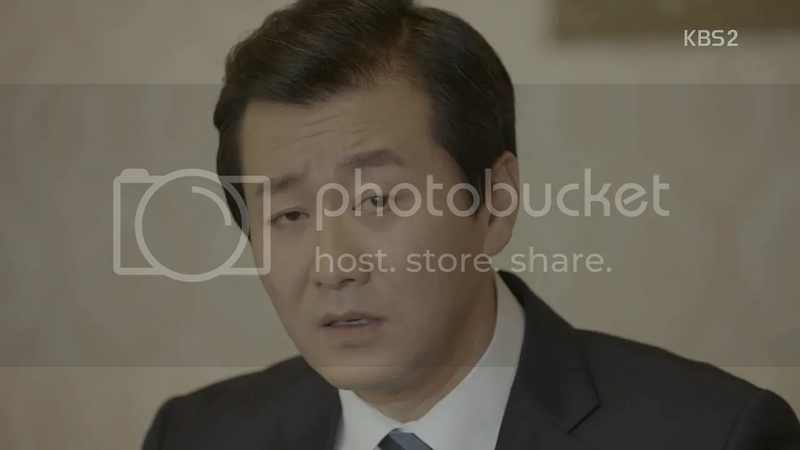 Moyeon watches him dispassionately as he loads money and diamonds, telling Fake UN to get rid of the kids (and anything that can’t fit in his briefcase). Those orders get transferred down to other men in the compound who leave to kill the children. Shijin intercepts them and fights several off until one of them drags out a child with a gun to his temple. Shiijn has no choice but to drop his gun, which is precisely when a shot rings. The man in front of him collapses. 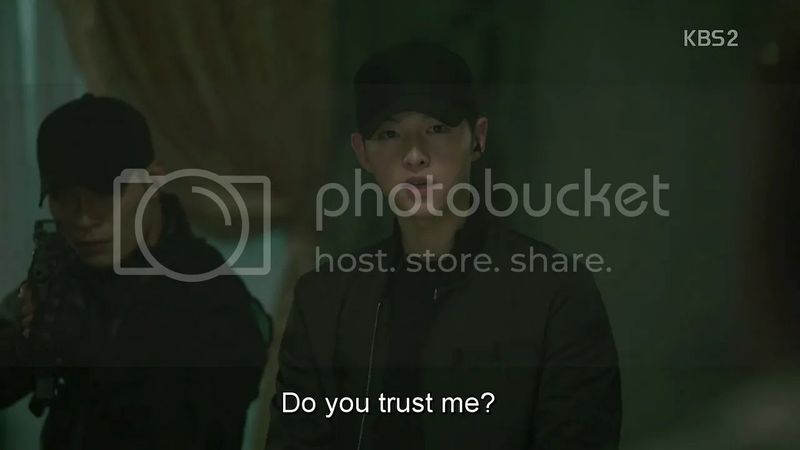 Shijin searches for the source, which is when Daeyoung and the Alpha team emerge and take over the situation. Shijin wonders what they’re doing there but Daeyoung has a better question. Haha. Shijin bluffs that he was opening his arms in welcome. Daeyoung says that Team Alpha’s returned for him. Shijin’s moved and promises to properly express his gratitude later. Calling each member by their codenames, he assigns them to positions. Wolf, Daeyoung and Snoopy, Mr. Grumpypants, are with him in rescuing Moyeon while the others are to bring the children to safety. 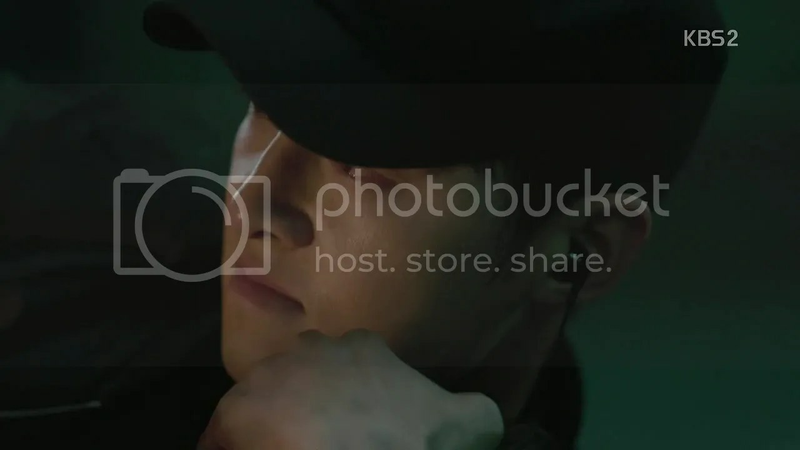 Meanwhile, General Yoon confesses that he sent Team Alpha on an unauthorized rescue mission (wait, so Daeyoung wasn’t acting on his own? 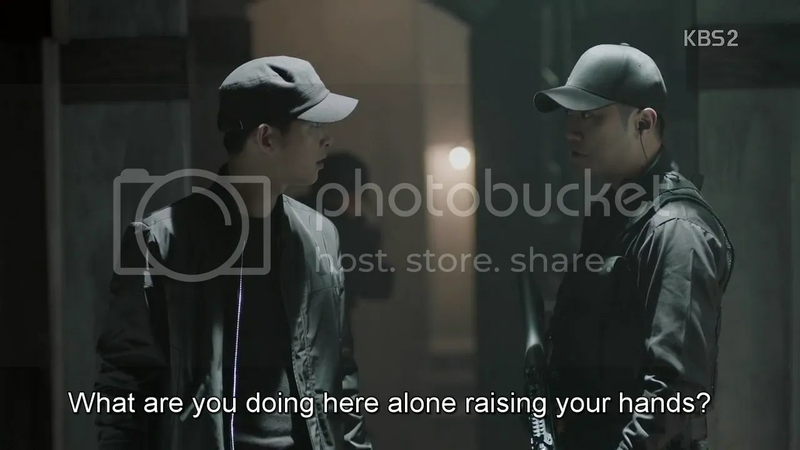 Or is General Yoon covering for his future son-in-law, knowing that there’s no way Daeyoung wouldn’t have gone after Shijin? I’m inclined to think the latter.) 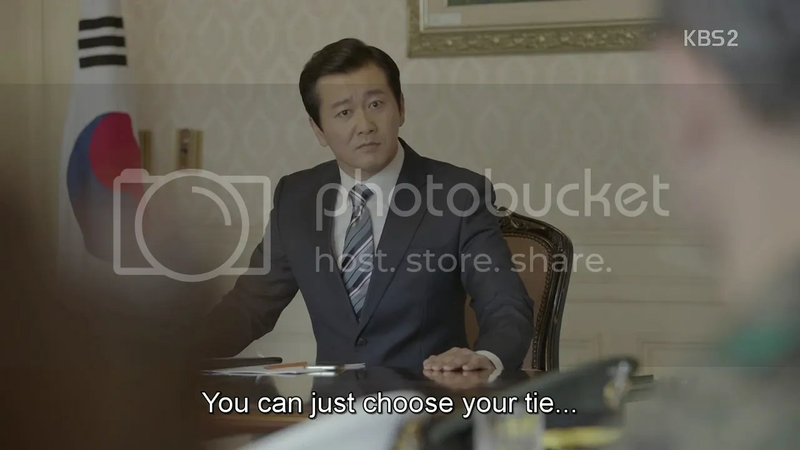 The Blue House politican Shijin (henceforth called Politician with a capital p) spoke to earlier is apoplectic with rage, yammering about the CIA having promised to rescue the hostage in 24 hours and how the Alpha team would ruin US-Korea relations if they botched a CIA operation. 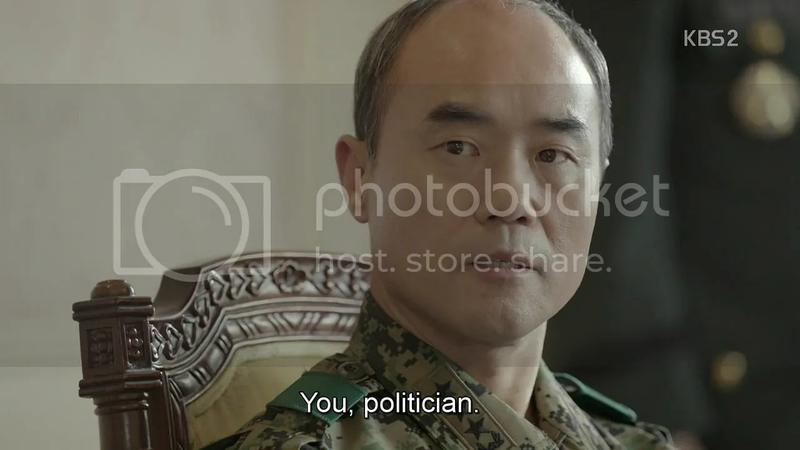 He serves General Yoon the same spiel he fed Shijin on this being a national and political issue and General Yoon snaps. He doesn’t care if all Politician cares about is looking good in front of the media, his men are out there risking their lives for nothing in return because they believe national security starts with the safety of citizens and not foreign relations. 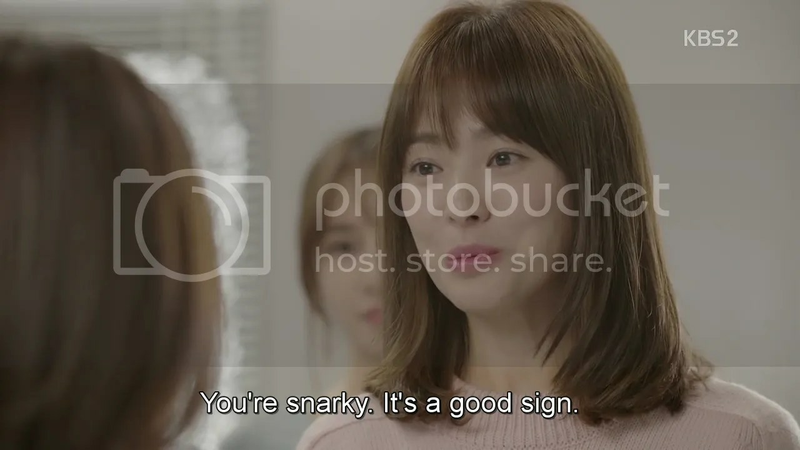 This is totally where Myeongju gets her sassiness from. Politician asks him if he’s willing to resign if things go wrong and General Yoon agrees, saying that he’s willing to do anything for an honorable cause. Meanwhile, his daughter’s feeling better. Sanghyun, Ja Ae, Kibum, and Minji gather around her to give her the herbal mixture Yehwa brewed for her. 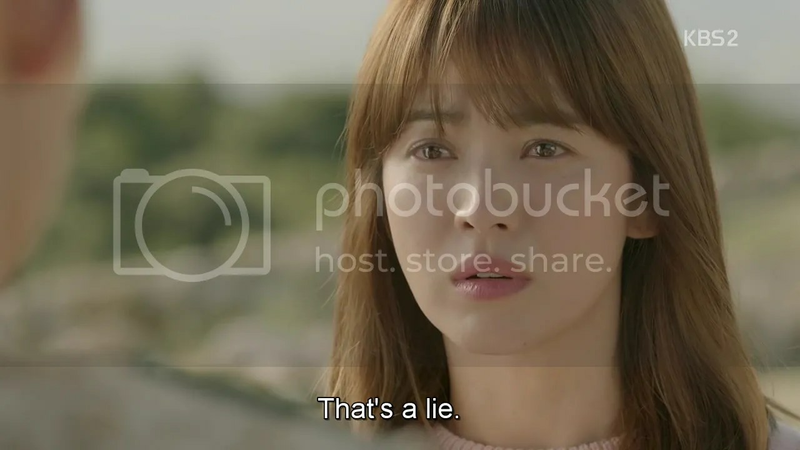 They ask her if it’s true that Moyeon was kidnapped and that Shijin and the others are after her. Myeongju nods, and tells them not to worry the Alpha team will use any means to get her out. Meanwhile, Moyeon’s time is up. Argus is all packed and ready for escape, dragging her along with him to ensure that Shijin has kept his end of the deal. 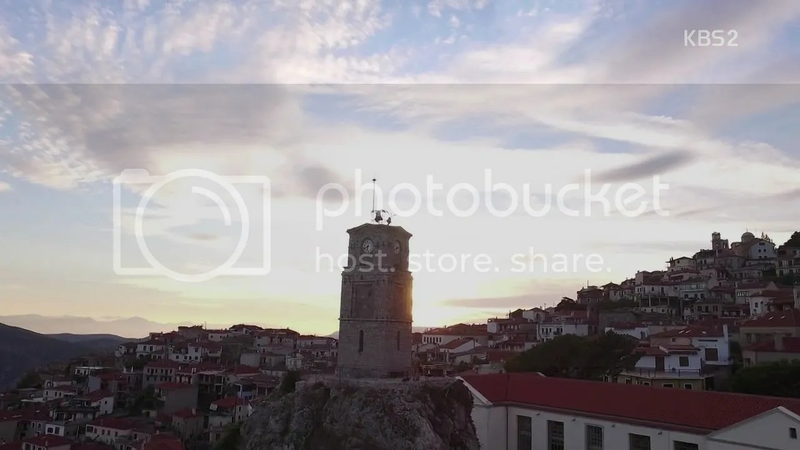 A helicopter circles around the compound. In the narrow corridor to the exit, Argus comes face to face with Shijin. Shijin says he’s kept his word and asks for Moyeon’s release. He freezes once he gets a good look at her face though and draws his gun on Argus. He has an earpiece in and orders all marksmen to train on Argus. 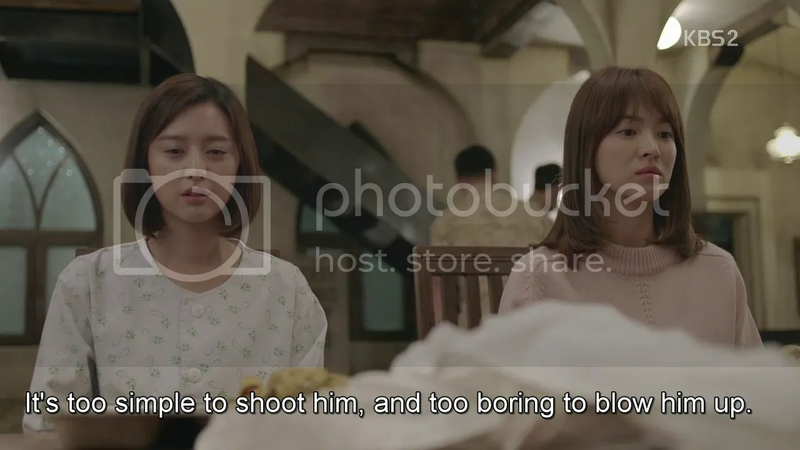 Daeyoung’s ready to shoot when Moyeong’s fully brought forward and Shijin sees the giant bomb strapped to her. Oh snap. A smirking Argus holds the detonator. Shijin asks Mr. Grumpypants aka. Snoopy aka. the team’s bomb defuser for help. They can’t shoot of Argus’s hand. Snoopy searches for a wireless transmitter from the detonator to the bomb vest. If Shijin shoots at it, he’ll cut the link between the two, allowing him to defuse the bomb without Argus blowing them all up. Shijin stalls for time while Snoopy searches for the transmitter. 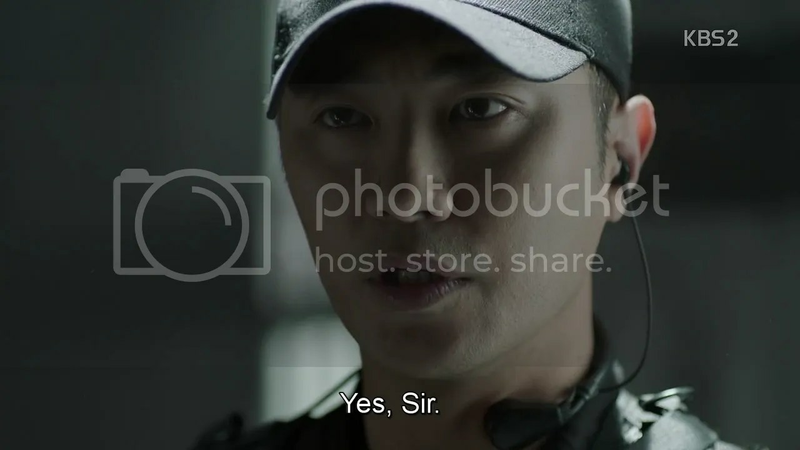 Argus wants the helicopter down and himself on it before he releases Moyeon, Shijin refuses, knowing he won’t keep his word. Argus is tired of the constant talk in Korea and asks Moyeon what they’re saying. Moyeon bravely answers that they’re talking about how beautiful the weather her. He rams a gun to her temple and Shijin fires a warning shot. The only person Argus needs to deal with, is him. Snoopy finds the transmitter on Moyeon’s shoulder. 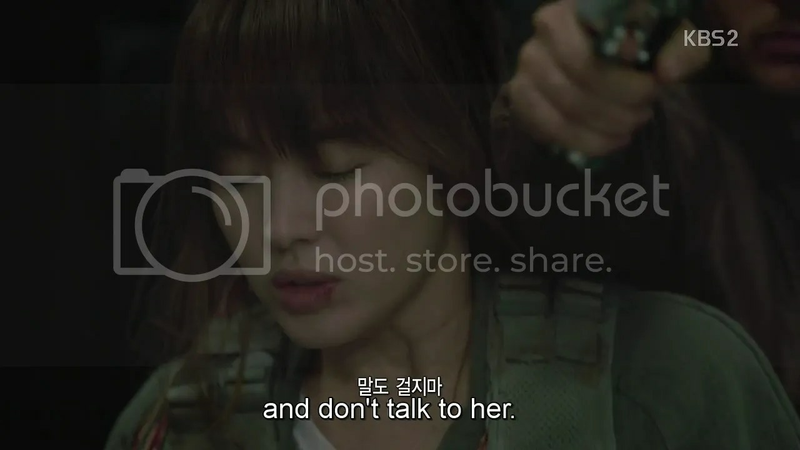 Shijin puts down his gun and addresses her for the first time, apologizing that he’s late. He tells her not to move, no matter what. With that he draws his gun and shoots at the transmitter on her shoulder, successfully hitting it. Pandemonium breaks out as each side starts shooting at the other. Argus goes down and the others flee. Shijin and Snoopy remain with Moyeon. Snoopy works on defusing the bomb while Shijin tries to calm a shaking Moyeon. He assures her that Snoopy Grumpypants is the best they have but Moyeon too busy asking him to save himself and flee. Her worry is for naught as Snoopy successfully manages to get the vest off her. He can’t stop the timer in time how and flings it out of the window where it detonates safely. Shijin covers Moyeon from the blast anyway and misses Argus regaining consciousness and reaching for his gun. Daeyoung’s warning comes too late and Shijin shields Moyeon from Argus, getting shot instead. Daeyoung tries to shoot in return but can’t get a clear shot. Shijin covers Moyeon’s eyes. A tear falls as he fires shot after shot. Argus falls, bleeding into his money. The next thing you know, Shijin and Moyeon are on the helicopter heading back to base. 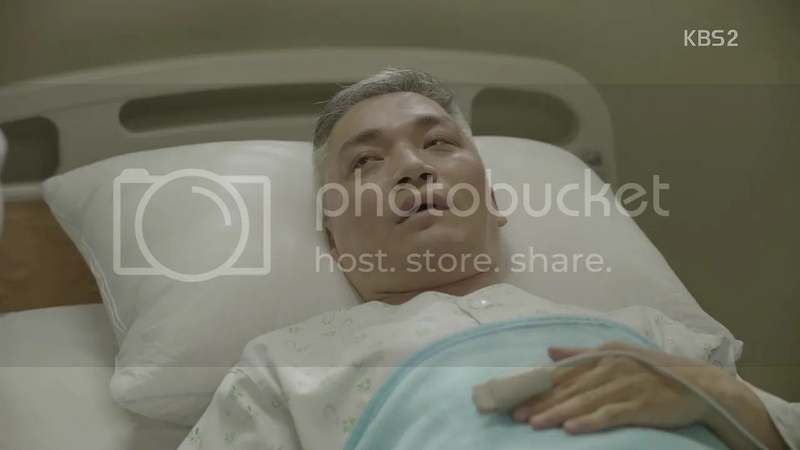 Shijin reports to General Yoon that the operation was a successful. Hostage rescued, target killed. 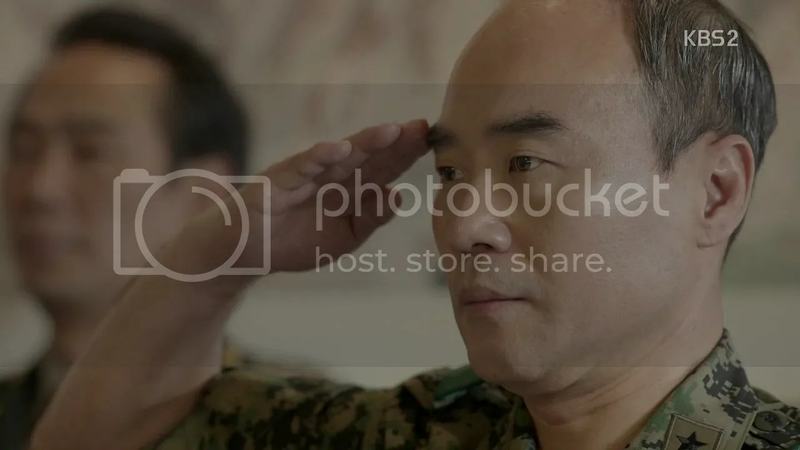 General Yoon commends him on the work done and refuses to punish him for any action taken. 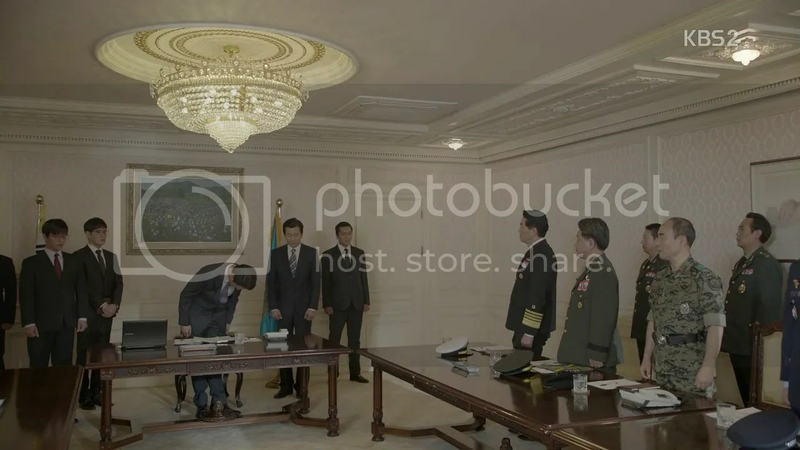 The call is heard by every member in the meeting and Politician is eager to strip General Yoon of his rank and status, but the President suddenly announces his entrance. 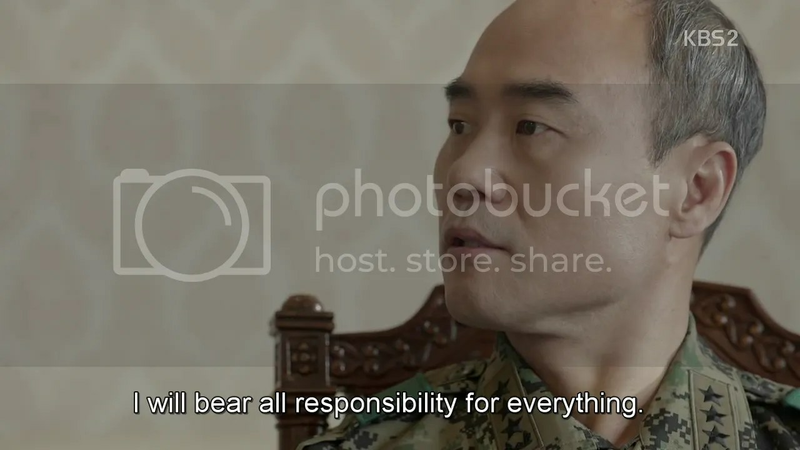 Politician is quick to inform the President of the unauthorized mission and points out that General Yoon has shown himself willing to take the blame. 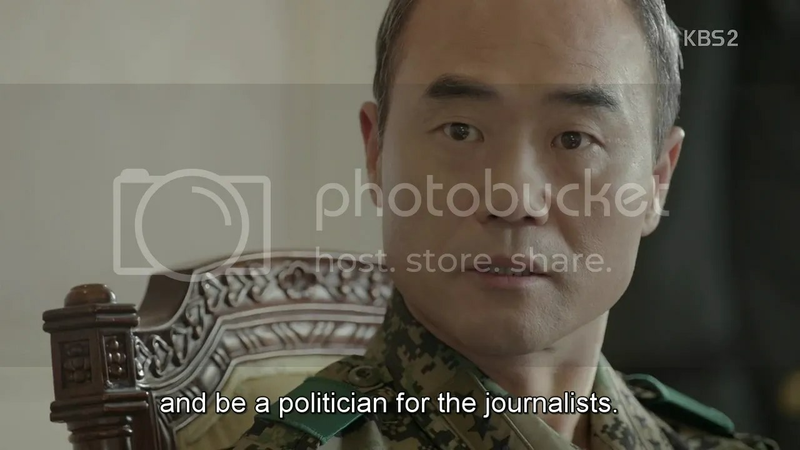 General Yoon agrees that he will, but the President disagrees. As he sees it, the general and his men have done their duty in ensuring the safety of a citizen. Any diplomatic or political repercussions fall to him, as President. He commends General Yoon on a job well done. Back the compound, Myeongju awakens with Daeyoung’s dogtags in her hands, having clutched them close even in sleep. She stares in front of her in shock before racing outside and embracing Daeyoung in an incredibly poignant scene. Moyeon walks outside and spots Shijin sitting on his own, staring a picture of him and Argus. He sets it on fire, looking devastated. She doesn’t make her presence known. Her gunshot wound, where the bullet grazed her earlier, is treated at the clinic. Sanghyun makes a joke of her needing vodka and what not and gets hit by Ja Ae for his efforts. Moyeon tears up watching then, and as they continue to banter, the stress of the past day finally gets to her and she crumples in tears. The others pat her back and try to cheer her up. The next day, the soldiers are back to running shirtless around the barracks. Daeyoung seems aware that they’ve got a fanbase and asks them to start singing their “Manly Men” refrain once they round the hospital team’s lodgings. The women cheer as the men wave and Sanghyun takes offense to the whole thing, calling after Daeyounga nd asking why he needs to be subjected to this “lewd spectacle” every morning. Daeyoung just pats him on the back and grins which does nothing for his mood. Moyeon’s missing from this admiration of men, taking in the scenery on a solo walk when she comes face-to-face with Shijin. He asks after her wound but she’s more concerned about Fatima’s whereabouts. He assures her that she’s being treated at Corps Command but she doesn’t believe him. She knows he lied to her about the children of the other village being safe, having been imprisoned with them at Argus’s lair. 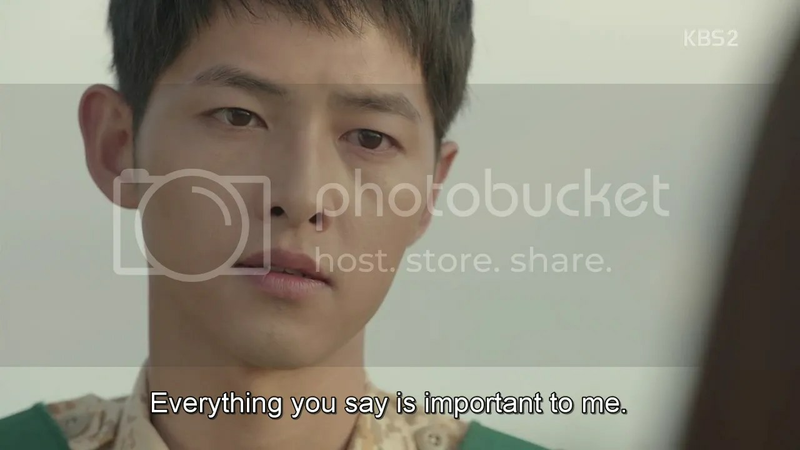 Shijin apologizes, saying that he didn’t want to worry but she wonders how many more lies he’s told for that reason. Shijin thinks back to the day they first met when he lied about how he got shot, about his lies in Urk, the car accident where he’d first gotten wind of arms dealing going on, of his first meeting with Argus. But he looks at her and lies once more, saying there were no other lies. Being his lies, there are people’s lives, and political and diplomatic relations at risk. His jokes where to cover up everything he was hiding. In comparison, her mundane worries and gripes about parking space and what to have for lunch are nothing. She truly believes he feels that way, but she can’t talk about stuff like that with someone who uses his body as a shield. With that, she walks away, Argus words reverberating in her head about Shijin vanishing and the possibility of him never coming back. Tying in nicely with his words is the placement of his coffin in a place back to America. Shijin watches a label being stuck on it with nothing more than his name, country of origin, date of birth and date of death. He’s joined by Somi’s father the present US Delta Force Captain who muses that over 200 people have to write reports because of him. Shijin apologizes for his actions and thanks the captain for not reporting him. The captain says he did report him, just a bit later than necessary. Shijin muses that Argus looks lonely in that coffin with no honor or country to serve. But the captain calls after him, asking him to stay alive even if they never see each other again. (Well that’s ominous). Shijin just smiles. Back at camp, Moyeon informs the others that they’ll be going home soon. Everyone’s reactions are subdued though, all of them having gotten attached to Urk. They make their rounds one last time as a group. They check up on Myeongju’s who’s back to normal, and even checks up on Moyeon’s own wound. Next on the list is Youngsoo. Moyeon informs him that he nearly got a lot of people killed but Youngsoo’s more focused on his diamonds. She happily tells him that they’re with the US military and he’ll never get them back. Oh and he’s being deported to Korea to pay for his crimes. Personally, I think he’s in for a relapse. 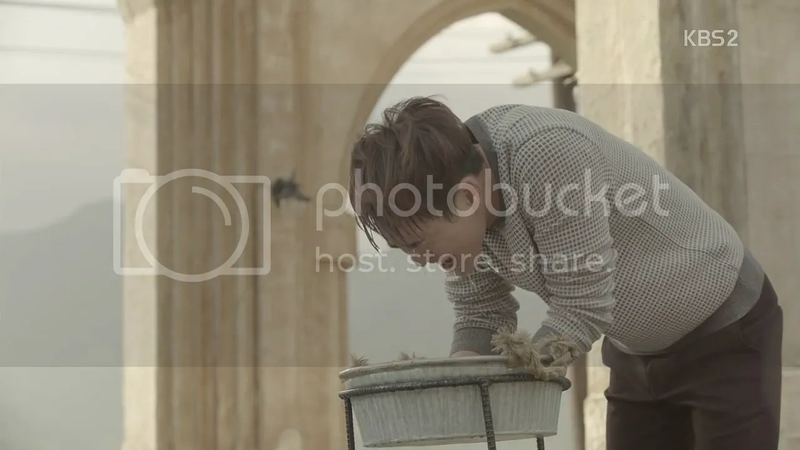 Next they check on Kang Minjae, who’s hale and hearty. He perks up upon hearing and Chihoon’s results have come out and volunteer to take them to him. He gruffly hands them over while Chihoon wonders what he’s doing in the quarantine area. He sees his results and is elated that he’s not going to die but sobers up with minjae asks if he’s that happy. Minjae mutters that he’s glad too though, and Onew Chihoon perks right up. He thanks Minjae but the latter gruffly asks him not to thank him or apologize again. 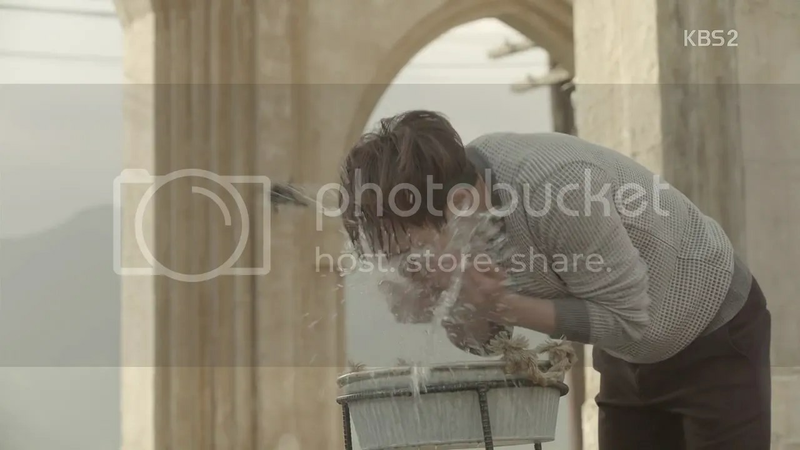 Chihoon’s on top of the world after this and does a facewash cf by the fountain. The kid he’d once thought was named Blackey shows up and notes that Chihoon is all better now. Chihoon races off and comes back with a present, a pair of limited edition shoes, saying that he can wear them when he gets bigger or sell them for money. The kid is hilariously uninterested in them, wanting a goat instead, but due to the language barrier, Chihoon thinks the kid’s saying he’ll miss him. He asks the kid’s real name and the kid just tries to explain to this strange Korean doctor that he wants a goat, but Chihoon takes his repetition of ‘goat’ to mean his name and all extra dialogue to mean that the kid’s glad to have met him. I LOVE that look on his face. He’s like “wtf’s up with this doctor?” Meanwhile, Moyeon broods on her own, thinking back to Shijin shooting Argus. Turns out his fingers didn’t cover much, she saw everything. Including him crying while firing. 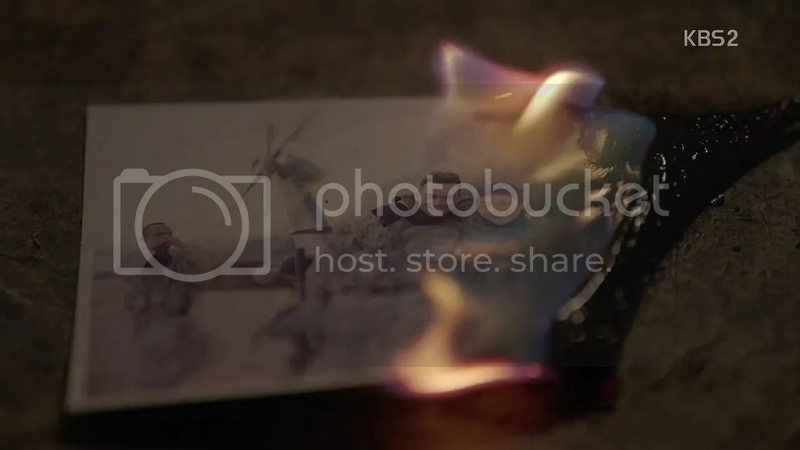 She also stayed for longer the previous night, watching him reminisce and weep while burning his single picture of Argus. Part of her wishes she had gone and comforted him the way he did for her, placing a hand over his face and asking him forget everything. In the present, she wipes away her tears and goes to see Shijin, asking him to make some coffee and join her outside. He’s surprised and nervous but agrees. He makes the coffee and brings it to her but she evades his outstretched arm and hugs him tight instead. She quietly tells him about her simple, mundane day and her irritation at not being able to find a hair elastic, before drawing back. From now, she says, she’ll be telling him every little thing. She’s going to do her best to cope with what he does so he should cope with her chatter as well. She asks for the right to be worried. She can’t worry about him nonstop when he’s not with her so she asks him for come up with some code word or phrase (like ‘I’m going to the department store’) that’ll let her know if he’s taking on something especially dangerous. She doesn’t want to be laughing or joking around when his life is on the line. Shijin begins to smile as Moyeon starts joking, asking him if he’d pick her over his country. 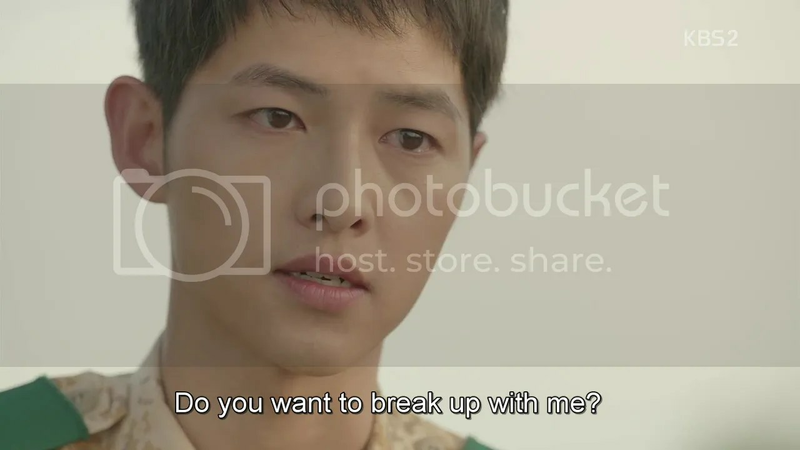 He asserts that he’ll pick her for now which has her mock-outraged, but the tension between then is gone and Shijin looks at her like the sun rises and sets on her before pulling her into a hug of his own. Awww. Myeongju and Daeyoung are being just as cute in the Medicube, with Myeongju listing off all the foods she wants to eat before realizing that everything she likes starta with an ‘s’ including Seo Daeyoung. Daeyoung jokes that she’s a swindler, which harkens back to their first meeting and has her smiling prettily. She takes off the dogtags she was wearing for him, and puts them around his neck. Both men are so pleased, they want to give back to their ladies in some way and try to cook them a meal much to Chef Kim Kibum’s exasperation. (I present to you, the two worst chefs in history). Kibum must have managed to rescue the dish in some way because Myeongju and Moyeon (who briefly comments on how good Shijin looks in an apron and makes his day) love it. Myeongju’s not falling for them having cooked it all by themselves either. She absently notes that she used to go to a really good chicken soup palace when she was in med school and Moyeon snarkily comments that she saw her there with Min Yoongi (the sunbae that caused their initial falling out). The comment begins a squabble on who was and was not actually going out with him which Shijin and Daeyoung lsiten to, growing more and more stone-faced. Both women finally realize that they’ve an audience but it’s too late. Shijin and Daeyoung mutter that they were yelled at for a single picture while Myeongju and Moyeon had been running after the same guy. They vow to hunt down the unfortunate Yoongi and throw down their aprons, discussing what form of torture to use on him. Myeongju’s appalled at their lack of teamwork but Moyeon’s more focused on how to get back in their men’s good graces. Myeongju smirks that all she has to do is act like she’s ill given that she’s an invalid at the moment. Moyeon tries out that tactic nevertheless. She runs into Shijin’s study, coughing like crazy but he’s not buying it. Haha. 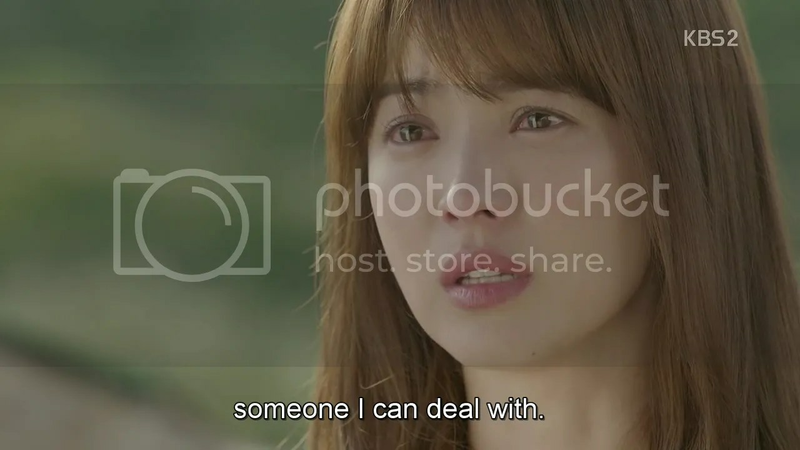 She gives up on the act and says she has to talk to him but Shijin isn’t done being petty. She finally decides to call Yoongi which gets his attention. He tries to snap the phone out of her hand like he did last time but Moyeon catches it before he does, leaving him utterly nonplussed. They’ve totalled three cars together, fallen into the sea, fought disease and she even has a gunshot wound because of him. But he’s always been honorable, and handsome. He’s pretty much ready to listen/do anything she wants after that speech. She asks if Daniel and Yehwa can be Fatima’s guardians but Shijin says he never knows when they’ll be on the move. He does know someone great, but he’s not sure if Moyeon would like her. 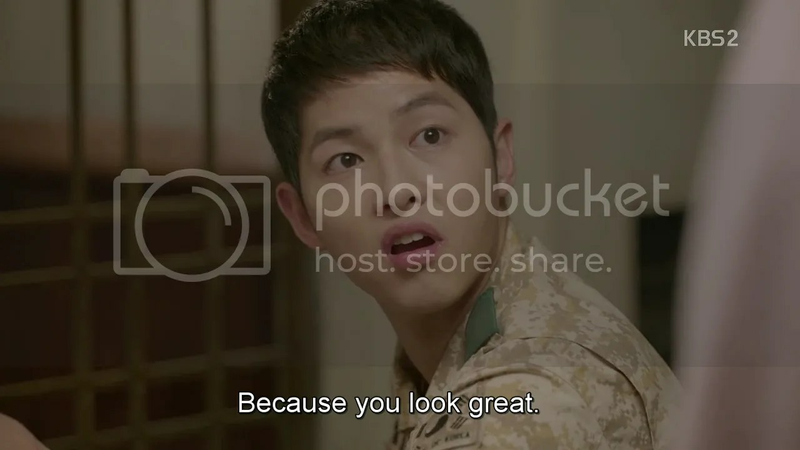 Cut to Shijin speaking to the girl at the bar, Valentine. He says Fatima was the girl she once saved by selling him information. Fatima instantly tries to get into her good graces, making Moyeon laugh. Moyeon wishes her the best and tries to get Fatima to promise to contact her. The girl’s as stubborn as ever until Valentine asks her to be nice, upon wish she wishes Moyeon all the best and hesitantly adds that she means it. Moyeon smiles. She climbs up a clock tower later with Shijin. They discuss what they’d like to do upon returning to Korea. They resolve to watch a movie at last. 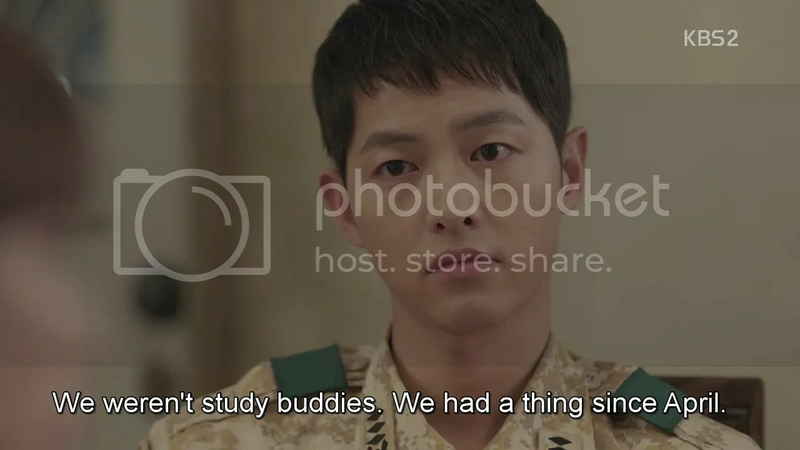 Shijin promises that he’ll be back in Korea soon as well and to wait for him. He tosses her the pebble they picked up at the shipwreck. Moyeon’s surprised that he’d kept it that long. He says it’s her turn to keep it well. He praises how well she’s done she returns the compliment. He draws her in for a kiss as the sun sets. The Haesung hospital team’s last day in Urk dawns. The women are out bright and early to watch the shirtless soldiers run They pause to find a new figure in the group. Shooting hearts at Ja Ae and running at the very front is Sanghyun. Minji giggle and asks Ja Ae why they don’t just date, sending her off in embarrassment while Moyeon smiles. Everyone’s all packed. The Korean flag is hoisted over the camp and the team bow their heads, remembering the time in Urk and helping out with the disaster, and how much they’ve grown as doctors and individuals. Unlike the last time they left Urk, Moyeon smiles for the group photo. The next thing you know, they’re back in Korea. The team unites for their first day of work since Urk, noting that it feels like their first day of work in general. With huge smiles on their faces, they head onwards. And Dayeong and Myeongju. They don’t need words.